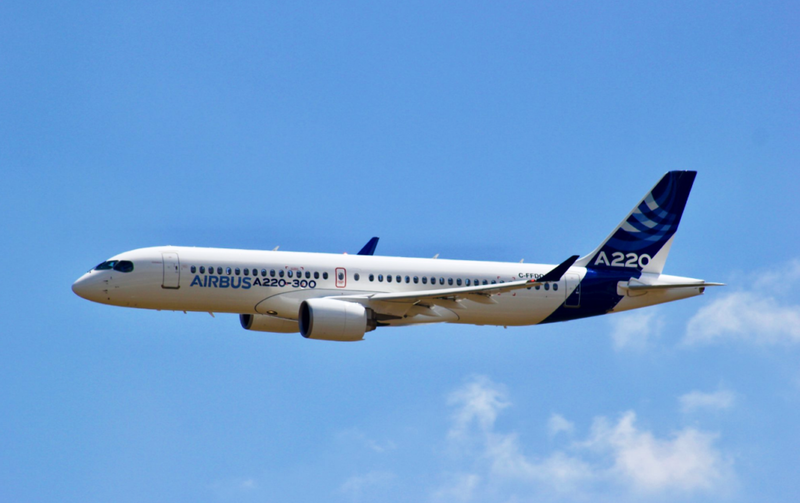 What are the prospects for the Airbus A220? July 11, 2018, © Leeham News. : With the CSeries repainted and rebranded in Airbus colors, will this change its fortunes? The aircraft has been on the market for 10 years and has not been a home run in term of sales. 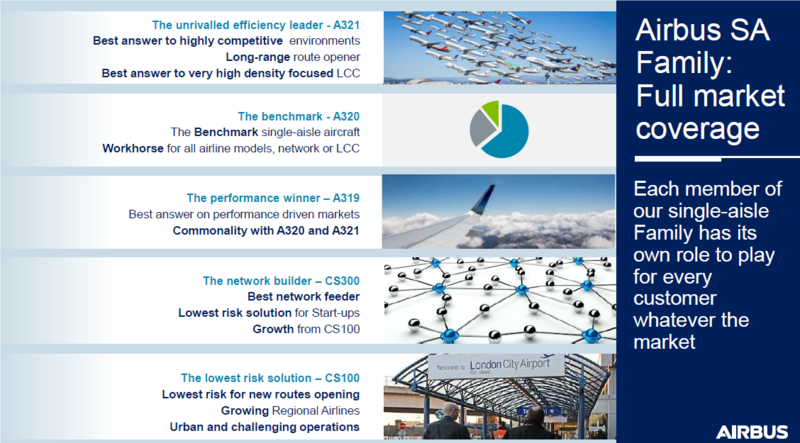 We look at how the A220 fits in the Airbus lineup and the sales plan the Airbus leaders say they have for the aircraft. In the presentations preceding the A220-300’s over-flight, the leadership of the Airbus-dominated A220 joint venture (CSALP, C Series Aircraft Limited Partnership) revealed how they see the A220-100 and A220-300 fit in the extended Airbus family. The A220-300, aka CS300, is the network feeder, Figure 1. The A220-100 (CS100) is a step-up regional aircraft and a route opener. Figure 1. Airbus positioning of its Single Aisle (SA) aircraft. Source: Airbus. The A319 is kept in the lineup, now positioned as a special performance aircraft with long range and good hot/high airport performance. Above the A319 the positioning is clear. The A320neo is a hot seller and it’s 40 seats larger than an equally configured A220-300. Airbus also claims the A220 shares the A320 DNA with 18-inch-wide seats in economy and the Pratt & Whitney GTF engines, making it quiet for take-off and landings. 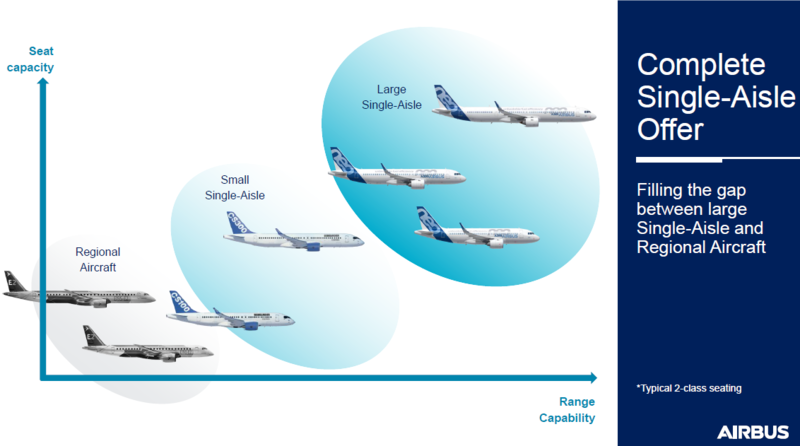 Airbus then showed a slide how the Airbus aircraft differ in seating and range and how its lineup is superior to Embraer’s E190-E2 and E195-E2 in range, Figure 2. Figure 2. Airbus lineup positioned on top of Embraer’s E2 E-Jet. Source: Airbus. As we will show in subsequent articles, this is a case of comparing Apples with Oranges. Airbus sales management said they expect 3,000 A220 to be sold over a 20-year period and sales this year would be high two digits. Later in the day, a JetBlue order for 60 A220 with a further 60 as options was announced. This was, of course, no coincidence. The events were closely timed, to give the new A220 series a kick-start as an Airbus aircraft. It will be interesting to see if this was the only order Bombardier/Airbus stocked for the launch or if we can expect more announcements at next week’s Farnborough Air Show. Production ramp up anyone? 15 to 25 (burst) built a month as this implies would be interesting to tool in Alabama/Quebec. Of Boeing did it in the Carolinas. AB too. But this was on mature aircrafts. I believe max planned capacities for the two FALs are 10/month in Mobile and 14/month in Quebec. But that is a long ways from todays 3ish/month. Mobile fully built out at 10/month maybe. But yesterday Airbus were talking about ~60 a year from Mobile which is 5 a month. That jives close to what BBD were saying when the line was announced (4/month). The 787 was not mature for the SC operation. AA is one of the biggest operators of A319’s (125), will be interesting to see what they will be replaced with. I suspect BA will put in a big effort to sell them a mix of 195E2’s and 737-7’s? Not sure what routes they are deployed on but could be another example where an A220-“500” (~150 seats) could tick the right boxes fitting in below the 737-8’s/800’s potentially offering very good seat mile costs. Still have to see if the CS-500 really works. Loss of range (more accurately the flexibility that gives you) for more seats may not be the ticket and needs more range. 3400 seems to be the required these days. Can belfast cope with building 24+ pairs of wings a month? Or will a line be opened in btoughton? But both broughton and belfast will be out of the eu zone soon (post brexit), and ab have put this in doubt. At least for now – with David Davis and Boris Johnson stepped back – there might be a way for a soft Brexit and no need to change things for Airbus’ wing factories in the UK. We will find out soon I guess. GB will most likely stay in the European Economic Area (EEA) and probably join EFTA again. So like Norway, Iceland, Switzerland and Liechtenstein they’ll have to accept most EU market regulations and in return enjoy almost free trade (agriculture is agreed on bilaterally). Furthermore, GB will have to contribute to the EU cohesion policy. Norway, Iceland and Liechtenstein agreed to provide 2.8 Billion EUR from 2014 to 2021, Switzerland separately agreed to provide a total of 1.302 Billion CHF from 2007 on. Compared to trade volumes, this is quite a bang for the buck. Since the support of the EU cohesion policy is formally not connected to trade policies, May can get her free trade agreement at no price and the EU can claim that GB pays some sort of contribution. It would be good to see a rational outcome. EFTA means free flow of labour, the main thing mosts Brexit supporters was trying to stop. No idea how this will end. There is a legal difference between the Freedom of Movement for EEA citizens (Direcive 2004/38/EC) and the Freedom of Movement for Workers in the European Union (Article 45 TFEU). GB wants get rid of the latter. I think you mean the EEA agreement, and you are right, the article explicitly mentions workers. However, the directive 2004/38/EC applies and allows certain regulation of the actual right to reside anywhere within the EEA for more than three month. From page 7 on: the negotiators seem to have already agreed on the EEA status quo. If they’re not working them already, extra shifts are a way of increasing output. Getting the extra staff is something they’d have to do anyway, no matter where they work, but multiple shifts is a way of not having to build another line. Regardless, there’s probably a degree of optimism floating round the factories at the moment. Could make recruitment easier. Give us your distraught depressed masses! All these people here starting to comment about how Brexit may affect lines in Belfast and at Broughton. Let me give you an answer. The answer is ZERO effect whatever the outcome of Brexit. I am astonished that NOBODY on these threads seems to know that Civil Aerospace internationally, under World Trade Organisation rules, is a NO-TARIFF regime. That is how Pratt manage to put their GTF’s on all those NEO’s along with many other American manufactured parts across all airbus platforms. It is how Rolls manage to put their Trents on the 787 programme. So why do people suddenly think that Brexit is going to stop things at Broughton, Filton & Belfast? Are people SO STUPID to think that…without thinking…oh…the A350 line will come to a grinding halt because Rolls can’t get engines to Airbus anymore?! The Airbus scaremongering over Brexit is exactly that. They have absolutely ZERO loss and no customs to clear. They fly their Beluga’s straight out of those plants currently and there will be no change to this procedure. It is about time that Scott Hamilton comes off the fence and puts and end to this nonsense into an article with all the facts to stop all these ill-educated comments on here. Isn’t under the WTO aerospace parts and aircraft exempt from tariffs? It is not tariffs, it is distruption of freight due to customs that is the main issue. Airbus has parts from around world including US, Boeing is the same. Is customs a big problem for them? How would Airbus account for the 400 or so CSeries orders inherited from Bombardier? Add all of them to this year’s tally or restate previous years’ totals whichever year they were firmed up? They wouldn’t be added to this year tally. There are is also nowhere near 400 orders for the C series that have to be back accounted for. Sites like Wikipedia are including Moxy and JetBlue in the order totals for example. Airbus might also use this time to start paring some of the questionable orders (ie Republic and Odyssey). Well Boeing claimed all of Douglas glory when they took over MD. I think that is flat oust a travesty. Douglas and then sadly MD stood alone in what they did. Going forward things adding the 717 are justified in adding to your (Boeing) order book. Prior delivery under MD, NO. You don’t buy someone history. The company I work for does not own my past work record, that is mine. Any deliveries under the new A/BBD thingy are fully warranted to allocated to Airbus. Orders can be as well as long as not prior delivered. Of course you can buy a company’s history. Airbus will add A220 orders to their tally as they come in, but I don’t think, for example, they are going to add DL’s 75 A220s to their 2018 order tally because they inherited it in 2018.
your company didn’t buy you. they rent your services. You can try to hi jack another companies history, but history says its their now yours. Furthermore, the perceived/actual value of the CSeries/A320s has dramatically increased since July first; it’s owner being on an exponentially more solid financial footing (versus risks of being “orphain”), combined with a dramatically expended after sale network. So any questionable early orders (with early launch prices) will be reviewed in order to free up slots for definitely more profitable sales. This is now a much more valuable aircraft, in a “whole package” perspective. Most important is to get those woeful production numbers up to at least a respectable amount. .40 a year isn’t going to cut it..
What do you tell a perspective customer now, thanks for the order ..your plane will ready in 5 yrs. Still not convinced engine snags are completely behind them as well..
More parked a220’s awaiting engines. .sounds very familiar. There are no parked A220 awaiting engines. All parked A220-100 are from orders that were postponed (some will be probably canceled). What orders were that? As far as I can see all the early orders for the launch carriers have been delivered. There is about 10 of all the very early production line that have been built but not gone to customers. That’s typical for most manufacturers for a brand new model bringing it into production. Boeing had up to 20 for it’s 787. Just read jetBlue also converted 25×320’s to 321’s. Could the 220-300 (-500?) become an “Pigeon pair” for airlines in future? Definitely – espacely if a A320.5 NEO and A322 NEO are launched. Relatively an easy undertakings once Boeing commits to its new NMA. You think we’re interested in the success of the 220-100/300? Boeing is monitoring this like a lioness watches her cubs (see trade tariff discussions). BA’s thinking, if we build that NMA, we’ll be behind on the NSA, and if we build a NSA, we’ll start cannibalizing 4000 737-Max orders. I halfway thought they’d come charging out of the dark and steal the CSeries from Airbus, by making Bombardier an offer they couldn’t refuse. But it’s too late for that now. Maybe they have to build that 767 replacement and hope they can sell 2000 planes. Both BA and AB are in a real up-swing in air travel. This is why they bought EMB,they are going to have to do both simultaneously. Little bit of a dangerous and desperate strategy. Whilst Airbus can seemingly match Boeing whith A320 tweaks, and saying the right things to the Canadians. I know Boeing said no more moon – shot projects, but I don’t see that they have much choice. What they produce next has got to be a big step better than anything that Airbus has, just so that the Europeans can’t get away with stretching this, or shrinking that. I mean, look at the A350 – one basic model that trounces 777x and makes 787 look slightly too small, and too heavy. Two for the price of one = bigger profits. I wish we could stop the moon shot nonsense. That was nothing more than management spin for their screwing up the 787. In, we let those damned engineers talk us into this, it not our fault. Going North of 1200 orders. Its going to see 2000-3000 deliveries before its all over. The 737 is selling just fine, amazing as that is. The C Series as good as it is is many years away from chi8pping away at the 737. You can’t do that with a CS-300. The CS-500 it its to be is at least 5 years out, they have a lot of production and ramp up to get going. Boeing makes more 737s in a month than the C can make in a year. By the time the C impacts the 737 they will have the Y3 on the way. Up until July 1st, you do realise BBD had no financial incentives to invest in the Mirabel ramp up, right? Like doubling the FAL floor space with a planned adjacent building etc. BBD only cared about getting the planes out with the current half baked / half finished FAL. I don’t think that’s entirely correct. Every dollar BBD would have put into CSALP (up to a couple of 100 million, this was capped in the preliminary Airbus deal), would have been a dollar of investment that would have swung from the Quebec investment fund share (19% owner) to BBD Share (31% owner) of the program. Edit: ex mil. Engineer is right. The deal I mentioned is for the period after the Airbus take over. Indeed Julian; after July 1st all BBD spendings will be accounting for. At the beginning, transformed into non-voting shares earning a 2% dividend, and later, proportionate to the respective ownership. FWIW, the Quebec gvt ownership will continue to decrease as they never and won’t provide any new fundings. Investment decisions in FAL scale up are probably easier today than last week.